USN Pure Protein GF-1 is a dietary supplement made primarily from concentrated whey protein. It is used by athletes to promote weight loss, muscle gains, faster recovery after workouts and increase energy levels. Besides providing 71 grams of whey protein per serving, USN Pure Protein GF-1 amino acids, vitamins, minerals and fiber that support protein synthesis within the body. This supplement used to be sold under the name USN Pure Protein IGF-1, suggesting a link between it and Insulin-like Growth Factor 1. However, the name was changed because this supplement does not contain IGF-1 and cannot directly increase levels of this growth hormone. Whey protein is also used to combat the effects of diseases that can cause muscle wasting and weakness (cachexia). Research shows antidiabetic, cardioprotective, anti-inflammatory, antilipemic, antibacterial, antiburn, bone protective, analgesic, prosatiety, antiobesity, renoprotective, hypotensive, immunomodulatory and other effects from taking protein supplements. USN Pure Protein GF-1 uses whey protein, which is considered the best form of protein for muscle growth. Once considered as a wasteful by-product of cheese production, whey is one of the two major proteins that milk is made from. The other class is casein. While casein is used for processed food production, and for industrial purposes like manufacturing glues, whey is used primarily as a safe and healthy food additive. It is present in various common foods like breads, ice cream, soups and baby formula. Whey is the liquid portion of milk which is left over after curds form during fermentation. It is concentrated with the amino acid, cysteine, as well as other branched chain amino acids (BCAAs). Whey was discovered as long as 6000 years ago when milk spoiled and naturally separated into curds and whey. Milk curds became the first forms of cheese. Much later, around 420 BC, Hippocrates touted the health benefits of whey consumption. Still later in 1650 AD, whey was consumed widely in Europe as a general health tonic. Powdered whey became available commercially in 1915; and in 1930 Robert Kraft began sponsoring clinical research on whey. By the 1960s, methods to remove the lactose from whey were developed. In the 1980s, various popular workout beverages contained whey protein as well. Today, research has established positive effects from increasing consumption of whey protein products for bodybuilders and athletes. The popularity of supplements like USN Pure Protein GF-1 continues to grow. Protein powder is consumed to improve muscle protein synthesis and to prevent muscle loss when dieting. This supplement was originally promoted under the name USN Pure Protein IGF-1, to suggest a link between it and levels of IGF-1 in the body. Insulin-like growth factor 1 (somatomedin C) is a protein that helps to promote bone and tissue growth in the body. It is rumoured to be widely used among professional athletes both to support muscle growth and to improve wound healing following an injury. A number of different supplements have been promoted as IGF-1 booster, including deer antler velvet extract. However, there is debate about how effective these supplements are, especially when administered orally. There is no evidence that USN Pure Protein can increase IGF-1 levels. For this reason, the name of the product was recently changed to USN Pure Protein GF-1. Despite the fact that whey protein cannot directly increase IGF-1 synthesis, research has shown it can induce other effects which may be beneficial to athletes and bodybuilders. Furthermore, whey protein is very safe with a low risk of adverse side effects. Human research has shown that whey protein supplementation reduces after meal glycemic spikes for a subsequently consumed meal. Additionally, USN Pure Protein GF-1 supplements contain high doses of certain amino acids, and protein hydrolysates, which have been shown to increase glucagon and insulin sensitivity. Other antidiabetic actions of whey protein supplementation include decreasing insulin responses to glucose, enhancing tolerance to oral glucose, upregulating secretion of glucagon-like peptide-1 (GLP-1), upregulating secretion of glucose-dependent insulinotropic polypeptide (GIP), and lowering glucose response rates to alpha lactobacillus. By preventing spikes in blood sugar, this supplement may inhibit the fat-storing effects of insulin. This could have positive effects during a bodybuilding cutting cycle. There has been research suggesting that increasing protein intake can improve weight loss and fat burning results. Supplementing the diet with USN Pure Protein GF-1 may also help to improve overall lipid profiles. In human research, whey protein supplementation has decreased intrahepatocellular (inner-liver) lipids, total triglyceride (TG) counts, low density lipoprotein cholesterol (LDL-C) and total cholesterol. Further, high density lipoprotein cholesterol (HDL-C) levels elevated with whey protein supplementation, especially when combined with resistance exercise training. Whey protein is known to positively affect cardiovascular health in several important ways. In animal tests, it has increased lifespan and decreased blood pressure. It has also increased availability of cardiac glutathione peroxidase. It has also upregulated glutathione in murine subjects with chronic iron overload. In human tests, whey protein supplements like USN Pure Protein GF-1 have decreased serum levels of IL-6 and increased levels of glutathione in patients recovering from acute ischemic stroke. Type 2 diabetes patients decreased plasminogen inhibitor-1 (PAI-1) and the coagulant actions of factor VII; both of which are known to increase the risks for developing cardiovascular system disease. However, USN Pure Protein cannot increase IGF-1 levels directly. Research into the effects of IGF-1 boosting supplements is inconclusive, despite their widespread use. 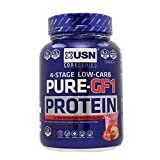 Certain individuals, such as those with Crohn’s disease and/or other conditions which hinder digestion due to intestinal inflammation, should speak with their doctors about the safety of taking USN Pure Protein IGF-1 or other whey protein products. Mobley CB1, Hornberger TA2, Fox CD1, Healy JC1, Ferguson BS1, Lowery RP3, McNally RM2, Lockwood CM4, Stout JR5,Kavazis AN1, Wilson JM3, Roberts MD1. Effects of oral phosphatidic acid feeding with or without whey protein on muscle protein synthesis and anabolic signaling in rodent skeletal muscle. J Int Soc Sports Nutr. 2015 Aug 16;12:32. doi: 10.1186/s12970-015-0094-7. eCollection 2015. Smiles WJ1, Areta JL1, Coffey VG2, Phillips SM3, Moore DR4, Stellingwerff T5, Burke LM6, Hawley JA7, Camera DM8. Modulation of autophagy signaling with resistance exercise and protein ingestion following short-term energy deficit. Am J Physiol Regul Integr Comp Physiol. 2015 Sep;309(5):R603-12. doi: 10.1152/ajpregu.00413.2014. Epub 2015 Jul 1. Mercola and others i dont se e here?